Make chewed-off leather handles a problem of the past! 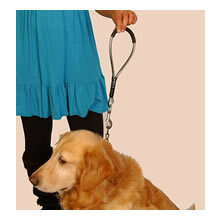 Replace them with out chew resistant heavy duty cable handle which will deter even the most determined chewers. Excellent for use with larger dogs, this handle lead survives a 1200 lb test. Attaches easily to chain leads with rust proof snaps.